In 2014, IC&RC is again partnering with Vendome Group, publishers of Addiction Professional and Behavioral Healthcare, to produce and promote the National Conference on Addiction Disorders. NCAD 2014 is slated to take place at St. Louis Union Station Hotel in St. Louis, Missouri, USA. The National Conference on Addiction Disorders has rapidly established itself as a premier, respected, and trusted national conference that provides a diverse educational curriculum on the prevention, intervention, treatment, and recovery management of addictions that affect various genders, generations, and cultures. The 2014 Conference, with partner IC&RC, will feature nationally recognized treatment providers, authors, and educators discussing a wide range of topics in a compelling array of keynote sessions and in-depth workshops. Addiction treatment counselors, social workers, therapists, physicians, nurses, and interventionists as well as the executive leadership of addiction treatment centers, behavioral healthcare organizations, and community mental health centers. Learn more at the NCAD website. IC&RC, the world leader in addiction-related credentialing, is pleased to announce the completion of its updated Alcohol and Drug Counselor Job Analysis (JA). IC&RC’s Alcohol and Drug Counselor credential is held by more addiction counselors than any other credential of its kind. A JA is the methodical process of determining what elements of practice and knowledge are important to assess as part of a certification examination and serves as the blueprint for the examination. It is the process that directly links an examination score to a specific job and ensures that an exam is valid, reliable, and legally defensible. To stay relevant to current trends and practices, a JA must be updated every five to seven years. The updated Alcohol and Drug Counselor Job Analysis will be used to develop a new examination to be administered by all IC&RC member boards in late 2014. More details regarding the first administration of the examination will be forthcoming. Changes in the JA include combining the previous eight domains into four essential domains and inclusion of DSM-5 diagnostic criteria. The full exam content outline and updated reference list can be found here. For more information on the first administration of this exam and all IC&RC’s testing policies and procedures, please visit our examination page at http://professionals.internationalcredentialing.org/. IC&RC is proud to stay in the forefront of the ever evolving field with the release of its updated ADC Job Analysis. Please feel free to direct any questions you may have regarding these changes to Rachel Witmer, Assistant Director at Rachel@internationalcredentialing.org. At the annual meeting of IC&RC, the Board of Directors, representing 77 certification and licensing boards from 24 countries and 45,000 professionals, re-elected Phyllis Abel Gardner, Professor of Sociology and Addiction Studies at Texarkana College, as President and Jessica Hayes, Executive Director of the Illinois Certification Board Inc. (ICB), as Treasurer. In their speeches, they both thanked delegates for their support. Both offices hold two-year terms. As a welcome to its home state, the North Carolina Certification Board for Addiction and Prevention Professionals hosted the Honorable Martha Beddell Alexander, former Executive Director of the Charlotte Council on Alcoholism, as the meeting’s keynote speaker. As State Representative for the 106th District in North Carolina, Alexander served 10 terms, including chair of Appropriations and vice chair for Education, Health, Judiciary and Mental Health Reform. During her service, she introduced and sponsored numerous legislative bills to enhance services for substance abuse education, prevention, and treatment. In 1993, during her first year in the General Assembly, she sponsored the substance abuse certification act in 1993. Now, she serves as the vice-chair on the Board of the National Council on Alcoholism and Drug Dependence Inc.
At the annual meeting, the Board of Directors planned for the future of the international organization. As a part of its business, the organization proudly welcomed Board of Spain Certified Addiction Counselors from Spain as a Member Board. It will offer the Alcohol & Drug Counselor credential. An existing board, Tennessee Certification Board adopted the Certified Criminal Justice Addictions Professional, Certified Co-Occurring Disorders Professional, and Certified Co-Occurring Disorders Professional Diplomate credentials. In an indication of the demand, three states - Maryland, Texas, and West Virginia - adopted the Peer Recovery credential. Phyllis Abel Gardner, IC&RC President, presented the Presidential Leadership Award to David Turpin, IC&RC Secretary, in recognition of his outstanding contributions to IC&RC and the prevention, substance abuse treatment, and recovery professions. The CEO/President of Clinical Services of North Carolina, Inc., Turpin is a therapist, clinical supervisor, and administrator in the fields of substance abuse and mental health. He holds licenses as a Psychological Associate, a Clinical Addictions Specialist, and a Certified Clinical Supervisor. He serves as the North Carolina Program Consultant for the Southeast ATTC, a Senior CARF Surveyor, and a Clinical Instructor at North Carolina State University in Raleigh. IC&RC, the world leader in addiction-related credentialing, is pleased to announce the completion of its new Prevention Specialist Job Task Analysis (JA). The updated Prevention Specialist Job Analysis will be used to develop a new examination to be administered for the first time on December 13, 2013 by IC&RC member boards. In addition to the new Communication domain, the former domain of Education and Skill Development has been changed to Prevention Education and Service Delivery. The new JA also broadens the scope of a Prevention Specialist from focusing strictly on Alcohol, Tobacco, and Other Drugs (ATOD) to encompassing aspects of mental, emotional, and behavioral health. The full exam content outline and updated reference list can be found on the following pages. The new examination will continue to have 150 questions, of which 25 will be non-weighted, pretest questions. 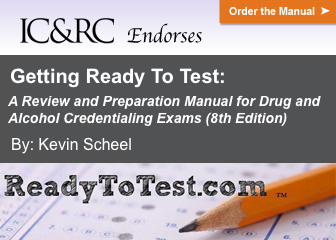 For more information on pretesting, please read Important Information Regarding IC&RC Exams. IC&RC is the only organization offering standards and an examination for Prevention Specialist certification and is proud to stay in the forefront of the ever evolving field. To learn more detailed information, please download the 2013 Prevention Specialist JTA Announcement. This document may also be used to share the news of the updated Job Task Analysis. Please direct any questions to Rachel Witmer, Assistant Director, at rachel@internationalcredentialing.org or via phone at +1-717-540-4457 Ext. 105. At its 2013 Semi-Annual Meeting in San Diego, California, USA, the IC&RC Board of Directors elected Annie Ramniceanu, MS, LCMHC, LADC, Associate Executive Director of Clinical Programs at Spectrum Youth & Family Services, as the organization’s Vice President. She will hold office until Fall 2014. Ramniceanu has worked at Spectrum for over 15 years, and she has focused on creating an organization where every system is based on research and evidence based practices. She has alos been the Principle Investigator on a three-year Substance Abuse and Mental Health Services Administration (SAMHSA) ROSC grant and an Adolescent Treatment Enhancement grant. Currently, she is the Chair of the Vermont Alcohol and Drug Certification Board, and since October 2011, she was served as IC&RC’s Marketing Committee Chair. Ramniceanu attended Amherst College and is a graduate of Columbia University. She completed a Master’s in Science in Counseling at the University of Vermont. She is licensed in Vermont as both a Clinical Mental Health Counselor and Alcohol and Drug Counselor. In 2012, she was awarded the Burlington Business & Professional Women (BPW) Woman of Achievement award. She was also chosen as one of Vermont’s 25 Most Outstanding Women by Vermont Works for Women Labor of Love 25th anniversary celebration. “I am very honored to serve the IC&RC as Vice President and look forward to contributing my skills and knowledge to a great organization and dedicated leadership team,” said Ramniceanu after the election. During the meeting, the Board of Directors also approved Minnesota Certification Board to adopt the Co-Occurring Disorders Professional (CCDP) and Co-Occurring Disorders Professional Diplomate (CCDPD) credentials. The future of the profession is at stake, and the nation’s leading addiction organizations are working to preserve it. Due to the rapid changes expected in the addiction profession through the Affordable Care Act and parity, three leading organizations in the field – NAADAC, the Association for Addiction Professionals, the National Certification Commission for Addiction Professionals (NCC AP) and the International Certification & Reciprocity Consortium (IC&RC) – are discussing collaborative activities to ensure professional quality in the delivery of prevention, intervention, treatment and recovery support services. In its Occupational Outlook Handbook, 2010-11 Edition, the U.S. Department of Labor (DOL) named substance abuse and behavioral disorder counselors as one of the fastest growing professions, expected to grow 21 percent by 2018. Despite this positive outlook, changes to practice legislation and funding streams make the future of the profession difficult to predict. “Our field is at a real turning point with drivers such as the Affordable Care Act, parity, and myriad challenges facing the addiction workforce looming large,” stated Mary Jo Mather, IC&RC Executive Director. The leaders of NAADAC, NCC AP and IC&RC view great strength in the strategy of collaboration. Together, the three organizations will work to influence federal policy, including workforce development issues within Substance Abuse and Mental Health Services Administration (SAMHSA), Health Resources and Services Administration (HRSA) and other departments. The goal of working together is to protect the addiction profession as a specialty within the primary healthcare system. Ideally, an economy of scale can be achieved in the managing, administering, programming and serving the addiction profession. “Now, perhaps more than ever, the addiction profession needs strong voices, unified messages and cohesiveness that our respective organizations can take the lead through joining forces and working collaboratively,” stated Cynthia Moreno Tuohy, NAADAC’s Executive Director. A crosswalk of credentials, leading toward standardized credentials and a national system of credentialing. With a shared goal of advancing the profession, NAADAC, NCC AP, and IC&RC are committed to cooperating as they meet the challenges ahead. NAADAC, the Association for Addiction Professionals, represents the professional interests of more than 75,000 addiction counselors, educators and other addiction-focused health care professionals in the United States, Canada and abroad. NAADAC’s members are addiction counselors, educators and other addiction-focused health care professionals, who specialize in addiction prevention, treatment, recovery support and education. The National Certification Commission for Addiction Professionals (NCC AP) has since 1990, instituted nationally recognized credentials specifically for addiction professionals. The NCC AP operates as an independent credentialing body, managing credentials and additional services, including test administration, certification standards, ethics codes of conduct and rules of credentialing development and procedure. IC&RC, the world leader in addiction-related credentialing, has protected the public by establishing standards and facilitating reciprocity for professionals since 1981. Today, IC&RC represents 76 member boards and 45,000 professionals from 24 countries, 47 U.S. states and territories. IC&RC’s nine credentials include counselors, clinical supervisors, prevention specialists, criminal justice, co-occurring disorders professionals, and peer recovery coaches. At its 2012 Annual Meeting in Minneapolis, Minnesota, USA, the IC&RC Board of Directors elected Bob Field, Executive Director of the Ohio Chemical Dependency Professionals (OCDP) Board, as its new Vice President and David Turpin to a second term as Secretary. Both offices carry two-year terms. Field has led Ohio’s state licensing and certification board that credentials chemical dependency treatment and prevention professionals since November 2003. He has served on a number of IC&RC committees and task forces, including Finance, Prevention, Clinical Supervision, and Business and Operations. He also served briefly as the Administrators’ Representative between 2005 and 2006. Previously, Field served for four years as the legislative liaison for the Ohio Department of Alcohol and Drug Addiction Services (ODADAS), where he worked on a number of state and federal issues. He is currently a member of the U.S. Army Reserve’s Individual Ready Reserve where he holds the rank of Colonel (COL), after having served thirty-two years in the Army National Guard. The Mexican Certification Board for Professionals on Addiction, Alcoholism & Tobacco gained the Alcohol & Drug Counselor (ADC) and Prevention Specialist (PS). The Maryland Addictions Professional Certification Board adopted the Co-Occurring Disorder Professional (CCDP). The Oklahoma Drug & Alcohol Professional Counselor Certification Board added the Co-Occurring Disorder Professional Diplomate (CCDPD) to its credentials. The additions maintain the trend of co-occurring disorders credentials being the fastest growing at IC&RC. In five years, they have grown by over 500 percent. “This woman has always done whatever she has been asked for IC&RC – with courage and perseverance. She has served on numerous committee and task forces, chaired the Finance Committee, and served on the Executive Committee. Her integrity is beyond reproach, her dedication is without match.” With these words, President Phyllis Gardner introduced the 2012 Presidential Leadership Award recipient: Kristie Schmiege of Michigan. Kristie R. Schmiege, MPH, CCS, CADC, CPC-M is a graduate of the University of Michigan-School of Public Health and has worked in the addiction field for 28 years including 10 years in local public health. She is currently Director of Prevention and Health Promotion for Genesee County Community Mental Health in Flint, Michigan and President of the Michigan Association of Substance Abuse Coordinating Agencies. Kristie is also Vice President of the Michigan Certification Board for Addiction Professionals. She is IC&RC’s Chair of the Credentialing Services and Peer Mentor Credential Committees. Since 1981, IC&RC has protected the public by establishing standards and facilitating reciprocity for the credentialing of addiction-related professionals. IC&RC represents 76 member boards and 45,000 professionals from 22 countries and 53 U.S. states and territories. IC&RC’s seven credentials include counselors, clinical supervisors, prevention specialists, criminal justice, and co-occurring disorders professionals. The organization is in the process of developing a Peer Mentor credential. The Addiction Technology Transfer Center (ATTC) network just released its long-awaited report, “Vital Signs: Taking the Pulse of the Addiction Treatment Profession,” prepared for the Substance Abuse and Mental Health Services Administration (SAMHSA). IC&RC has long been concerned about the shortage of professionals entering the workforce and we do everything we can to promote the profession. We certainly support the recommendations - improving reimbursement rates, healthcare benefits, access to continuing education - that will increase the number of professionals entering and staying in the field. IC&RC supports a career ladder for prevention, treatment and recovery professionals, but it must include all levels of education and clinical practice. It is for this reason that our credentials offer a pathway for advancement, from entry-level to advanced practitioners. Our first concern is protecting the public. As always, IC&RC credentials demonstrate that professionals - regardless of background, degree, or license - have adequate training in evidence-based and recovery-oriented methods of treatment and prevention. A final caution: In this climate of integrating substance use disorders into the larger mental health field, it is very important to remember that treating co-occurring disorders is a distinct discipline and requires specific training. 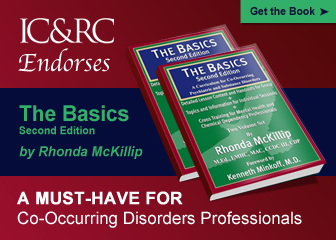 While professionals may have mental health-specific or addiction-specific training, any professional treating clients with co-occurring disorders should have competency in the interaction of substance use disorder and mental illness. 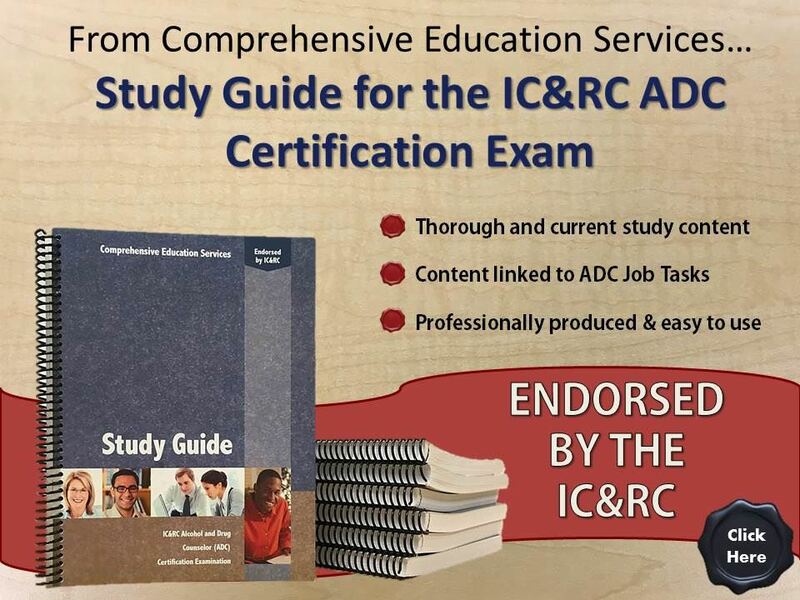 IC&RC has the right credentials - the CCDP and AADC - to allow professionals to demonstrate competency in this area. These documents can be used to educate legislators, treatment providers, educational programs, and others about the importance of credentialing. IC&RC has selected Deanne Bergen, ICPS, as the recipient of the 2012 IC&RC Prevention Professional of the Year Award. The IC&RC Prevention Professional of the Year Award seeks to honor the best of the best: the certified preventionist who best embodies the ideal of the profession and of IC&RC. This year, IC&RC received nominations from Arkansas, Delaware, Georgia, Kentucky, Maryland, Mississippi, North Carolina, South Carolina, and Texas. Bergen was the founding President of the Prevention Credentialing Consortium of Georgia (PCCG). During her four-year tenure, she stabilized the fledging organization. She has worked with Georgia Family Connection Partnership, Inc., Drug Free Coalitions, and Suicide Prevention Awareness in multiple counties, as well as KidsNet Savannah and Positive Parenting and Teen Pregnancy Prevention classes. She has developed multiple trainings, such as Ethics for Preventionists, How to Survive the Credentialing Process, and the Fundamentals of Prevention. She is a true champion within the prevention community locally and statewide. She remains the "go to" person for consultation, training and education and is widely acclaimed in Georgia. Substance abuse is one of the greatest public health challenges of our time, and its success depends on a workforce of qualified prevention professionals trained in evidence-based practices. IC&RC’s competency-based Prevention Specialist (PS) credential offers a consistent standard of knowledgeable and well-qualified individuals practicing prevention in our communities. Certified prevention professionals help ensure that programs and their funders are delivering on their mission of ensuring public safety and well-being. Adopted in 1994, the Prevention Specialist is one of the fastest growing credentials in the field of addiction-related behavioral health care. This credential is recognized worldwide as the gold standard for competency in the field, and it is written into U.S. state and national practice regulations and insurance legislation. Prevention professionals are working all over the world – partnering with parents, community groups, coalitions, faith-based organizations, health care professionals, law enforcement, businesses, and educators – to make a difference in their communities. Among them are the professionals who go above and beyond, truly standing out in their dedication, intelligence, compassion, and effectiveness. It is those professionals – like Deanne Bergen of Georgia - whom IC&RC seeks to recognize. Since 1981, IC&RC has protected the public by establishing standards and facilitating reciprocity for the credentialing of addiction-related professionals. IC&RC represents 76 member boards and 45,000 professionals from 24 countries and 47 U.S. states and territories. IC&RC’s seven credentials include counselors, clinical supervisors, prevention specialists, criminal justice, and co-occurring disorders professionals. Receive important information on conferences and training opportunities, updates on our examinations, and other news from the field. © IC&RC. All Rights Reserved.